Spring has finally arrived! Which means that it's finally warm enough to spend the evening outside. My family loves to BBQ, and even though I'm not a big fan of meat I love sitting outside for dinner, watching the sun go down while listening to the birds chirping. Time slows down, dinner takes longer and suddenly we all sit together in piece for hours. Besides the atmosphere, what I love most about BBQing is the dessert, which has to meet two criteria: it should be summery and at the same time easy and quick to make. No one wants to slave away in the kitchen for hours while everybody else sits outside, enjoying themselves! So I came up with this delicious dessert. This takes about 10 minutes to prepare and the best thing is, you can do this ahead of time. All you have to do before serving is wash the berries! That's it. Hopefully there will be many more evenings spent outside, enjoying this dessert! Beat the double cream with the scraped vanilla seeds and the powdered sugar until stiff. 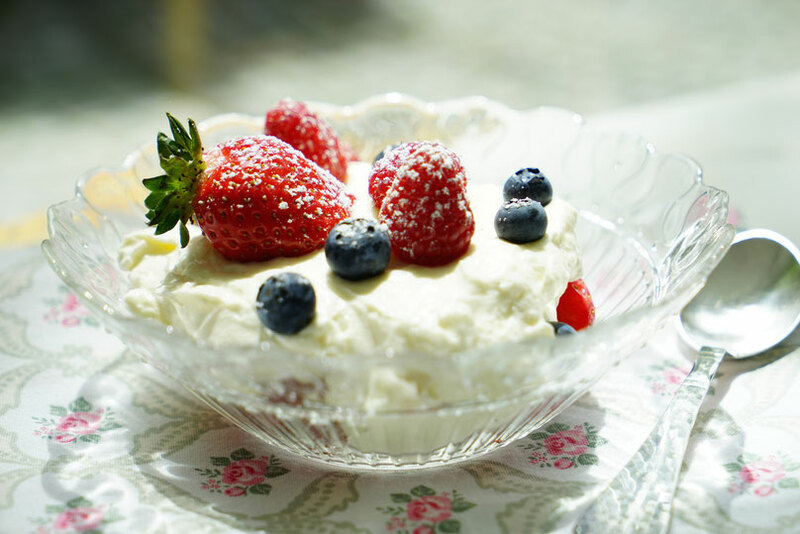 In a different bowl, beat the mascarpone cream with an electric mixer for about a minute to make it soft and creamy. 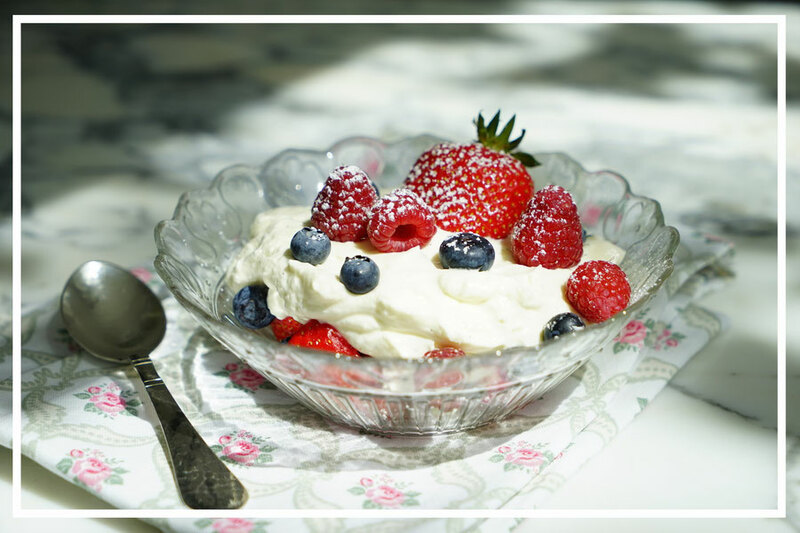 Mix the double cream with the mascarpone cream, either by hand with a wisk or with an electric mixer. Do now overbeat. Fold in the Cointreau. It's an orange liquor, which you can't really taste, but it enhances the flavor of the berries. If you find that the cream is too stiff, add some milk little by little until it reaches the desired constistency. Put it in the fridge until ready to serve. Wash all the berries, except for the raspberries. You might want to cut the bigger berries in half. Add the washed berries to a bowl and carefully add the powdered sugar with a spoon. Add the raspberries right before serving, as these tend to get mushy.